With its exceptional thermal performance and fatigue resistance, the compact-sized Alfa Laval DuroShell plate-and-shell heat exchanger opens up a whole new world of possibilities. 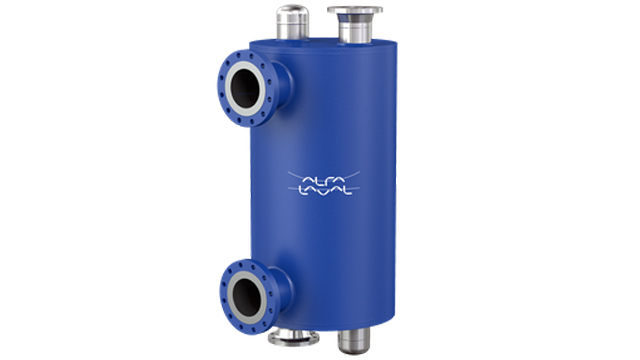 Designed for use with liquids, gases and two-phase mixtures at pressures up to 100 bar (1450 psi), in both PED and ASME, and at temperatures up to 450°C (842°F), Alfa Laval DuroShell is suitable for a wide range of aggressive media. Based on our ground breaking DuroCore technology, Alfa Laval DuroShell features a patented roller coaster plate pattern for exceptionally high thermal efficiency and maximum turbulence. The heart of DuroShell is a cylindrical pack of corrugated, uniquely cut and laser-welded heat-transfer plates that leave an open channel on each side of the shell, thus enabling multi-pass design. The plate side distribution tubes go all the way through the plate pack and ensure the best distribution of media onto the heat transfer surface. Having the distribution tubes running inside the shell also adds to the strength of the plate pack. With laser technology we can achieve the most accurate weld with less heat impact on the surrounding material. This results in a weld with less stress and significantly improved fatigue properties. Our fully welded heat exchangers use established laser welding that has been proved through thousands of installations around the world. AlfaLaval DuroShell is specifically designed to withstand variations in pressure and temperature. To accomplish that, we had to move away from the traditional plate-and-shell design with its weak, peak-stressed spots. Traditionally corrugated plate-and-shell pattern promotes expansion and contraction in one dimension only. This makes the plates sensitive to fatigue failures. DuroShell’s unique and patented roller coaster plate pattern is equally strong in all directions. The result is a plate pack that is robust against both thermal- and pressure fatigue. Alfa Laval DuroShell operates with one media on the plate side and the other on the shell side, both of which can be rated to the full 100 bar. In the single pass configuration the exchanger works in pure cross-flow. In the multi-pass arrangement this becomes a global counter-current configuration. Since the nozzles on the shell side are completely independent to those on the plate side the heat exchanger is perfect for assymentric flow duties. Designed for high turbulence, even at low velocities, Alfa Laval DuroShell’s unique plates minimize fouling.